When you update the software on your phone, it takes some effort to adapt to changes to the software you have become so used to. You have to learn how it works, but why shouldn’t the technology adapt to you as well? This work caught the attention of the Institute of Electrical and Electronics Engineers, which presented three ASU faculty members and one ASU postdoctoral researcher the 2017 IEEE MultiMedia Best Department Article Award on Oct. 26, at the 25th ACM Multimedia conference in Mountain View, California at the Computer History Museum. “It’s a paradigm that proposes ideal technological designs as individualized designs: technology that adapts to its users over time through continual use,” McDaniel said. McDaniel, alongside Panchanathan, Chakraborty and Tadayon, focused on applying the new model to social assistive aids for individuals who are blind, and rehabilitative technologies for individuals who have suffered strokes. CUbiC’s core research in multimedia computing, machine learning, computer vision and haptics is driven by application areas of assistive, rehabilitative and healthcare technologies for individuals with disabilities. The researchers addressed this concern by exploring coadaptive algorithms, which allow both the person and the machine to adapt to each other over time. “That’s what person-centeredness is all about — the technology adapting to you so that it's perfectly suited for you,” McDaniel said. One application of the new paradigm is the Social Interaction Assistant, an assistive device that allows individuals who are blind access to nonverbal social cues, such as facial expressions. 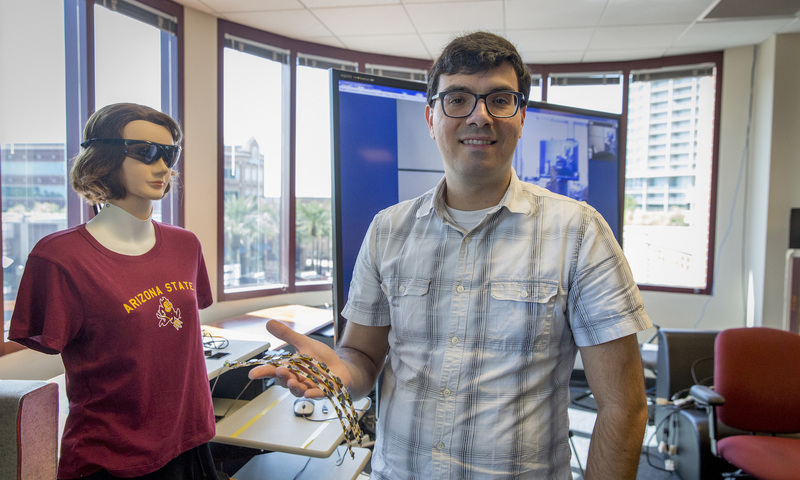 A body-worn or tabletop webcam would use machine learning and computer vision algorithms to recognize nonverbal cues of interaction partners as well as haptic, touch-based delivery devices for discreet, personal communication to an individual who is blind. Coadaptive algorithms can also be used to improve accuracy of machine learning and computer vision algorithms, like the ones used in this technology, by considering context and the behavior of the user. A year after the article was published in August 2016, it won the Best Department Article award, assuring the researchers that they were on the right track. “My impression is that people are recognizing the work and identifying something that’s an important and useful contribution,” McDaniel said. McDaniel’s team is now applying person-centered multimedia computing to other applications. Stephen Albert Johnston and Deirdre R. Meldrum of the Biodesign Institute at Arizona State University have been named fellows of the National Academy of Inventors (NAI), the organization recently announced. Johnston is director of the Biodesign Center for Innovations in Medicine, a professor in the School of Life Sciences and CEO of Calviri, Inc., an ASU startup. Johnston has experience in basic science, notably first cloning the Gal4 gene, showing that proteins have separable functional domains and discovering the AAA proteins and their role in transcription. His focus now is in translational sciences and technology development. In 2012, for example, Johnston, along with fellow ASU professor and co-founder Neal Woodbury, spun out a startup, HealthTell, built around a new liquid-biopsy technology. In 2017, the Chinese company iCarbonX formed an alliance with HealthTell to make its ImmunoSignature technology available in China, Singapore and Taiwan. The innovation is part of $400 million international Digital Life Alliance aimed at producing a personalized health guide for consumers. From just a single drop of blood, this diagnostic powerhouse can detect diseases that involve an immune response (autoimmune, cancer, infectious disease, metabolic and neurologic diseases). In his career, Johnston was also co-inventor/innovator of pathogen derived resistance, endosperm balance number, organelle transformation, the gene gun, genetic immunization, TEV protease system, expression library immunization, linear expression elements, synbody therapeutics, immunosignature diagnostics and neoantigen preventative cancer vaccines. Johnston is author of over 170 journal articles, has over 25 patents and has garnered approximately $95M in grant support including large programs from DARPA, NIAID and NHLBI. He was named Arizona Bioscience Researcher of the Year in 2016. Meldrum is director of the Biodesign Center for Biosignatures Discovery Automation, distinguished professor of biosignatures discovery, professor of electrical engineering, and previous dean of the Ira A. Fulton Schools of Engineering at Arizona State University. Meldrum was also director and principal investigator of the NIH Center of Excellence in Genomic Sciences (CEGS): Microscale Life Sciences Center (MLSC). She is known for her ability to integrate multiple disciplines, including bioengineering, biomaterials, nanotechnology, electrical, chemical, and computer science engineering with fields such as biology, genomics, proteomics and single cell analyses to create new paths of discovery. She was a member for two terms of the National Advisory Council for Human Genome Research, U. S. Department of Health and Human Services and is currently a member of the Scientific Advisory Committee for the Department of Energy (DOE) Joint Genome Institute (JGI) and vice-chair of the Northern Arizona Healthcare Foundation. She is a fellow of the American Association for the Advancement of Science, the Institute of Electrical and Electronics Engineers and the American Institute for Medical and Biological Engineering. Meldrum is author of 231 peer-reviewed publications including 122 journal articles, has 35 patents including 7 issued and has been awarded over $80M in external grant funding from the NIH, NSF and the Keck Foundation. Johnston and Meldrum join several other ASU faculty, including Charles Arntzen, Bruce Rittmann, Stuart Lindsay, Michael Kozicki, and Sethuraman “Panch” Panchanathan who have been equally honored as NAI Fellows in recent years, helping to further raise ASU’s reputation as a leader in innovation. In addition, in another strategic effort to foster ASU innovation throughout its entrepreneurial ecosystem, ASU recently formed a NAI Chapter earlier this year. Launched in March 2017, it recognizes inventors and promotes innovation across all disciplines of the institution. Those elected to the rank of NAI Fellow were nominated by their peers for outstanding contributions to innovation in areas such as patents and licensing, innovative discovery and technology, significant impact on society, and support and enhancement of innovation. On April 5, 2018, the 2017 NAI Fellows will be inducted as part of the Seventh Annual NAI Conference of the National Academy of Inventors at the Mayflower Hotel, Autograph Collection in Washington, D.C. Andrew H. Hirshfeld, U.S. Commissioner for Patents, will provide the keynote address for the induction ceremony. The 2017 NAI Fellows will also be highlighted with a full-page announcement in The Chronicle of Higher Education Jan. 19, 2018 issue, and in an upcoming issue of Science and Technology and Innovation, journal of the National Academy of Inventors. Included among all NAI Fellows are more than 100 presidents and senior leaders of research universities and non-profit research institutes; 439 members of the National Academies of Sciences, Engineering, and Medicine; 36 inductees of the National Inventors Hall of Fame; 52 recipients of the U.S. National Medal of Technology and Innovation and U.S. National Medal of Science; 29 Nobel Laureates; 261 AAAS Fellows; 168 IEEE Fellows; and 142 Fellows of the American Academy of Arts and Sciences, among other awards and distinctions.